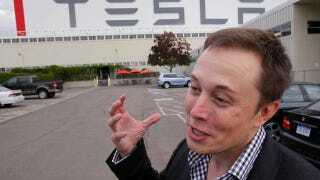 Elon Musk on Top Gear: "It was fucked up"
After launching the public relations campaign/lawsuit against Top Gear last week over its withering test of the all-electric Tesla Roadster, Tesla CEO Elon Musk finally spoke out today. His reason for suing? Tesla's investors kept asking about it. Speaking to The Detroit News after a speech in Washington earlier today, an agitated Musk compared Top Gear, the BBC motoring show, to Milli Vanilli, repeating the claims in Tesla's lawsuit that the show had decided to pan the car before it tested it, a contention Top Gear producer Andy Wilman rebutted here on Jalopnik this weekend. Musk also said the BBC had apologized to Tesla, but had kept airing the show with no changes: "If somebody punches you in the face and says sorry and then keeps punching you in the face, what are you going to do? It's just wrong." Musk's ask to stop the fight? Have the episode dropped or altered with a disclaimer, something that's been rejected by the BBC and Top Gear so far. While Musk has steered Tesla to the point where a Wall Street analyst considers it America's fourth great automaker-in-waiting, the company has yet to turn a profit, and won't until after the Model S sedan goes into production next year. Until then, it has to survive on sales of the Roadster, especially in foreign markets where "Top Gear" is most popular. Regardless of the legal outcome, Musk gives Tesla some added marketing simply by stepping into the ring.